Everyday gadgets are becoming more and more integrated into our everyday lives and like our smartphones, we’re starting to become addicted to getting the latest and best new gadgets for our homes. As technology advances so do the gadgets that are ending up in our very homes, from curved smart TV’s to intelligent fire alarms, our homes are becoming smarter with the help of technology. So we’ve gone ahead and pick our 5 favorite gadgets to help make your home smarter and more futuristic. 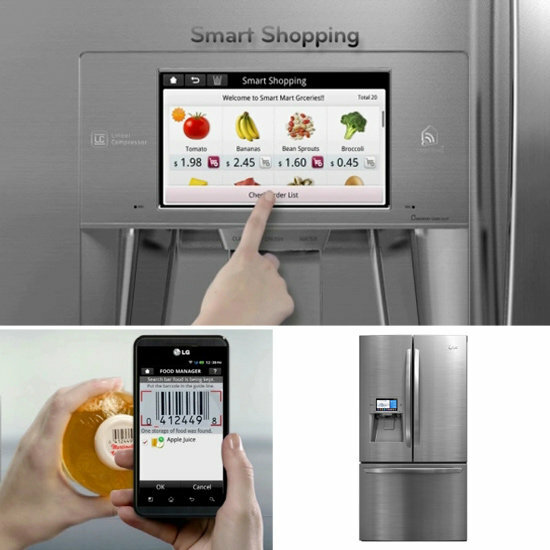 It may sound weird but LG is working on Smart Fridges and washing machines. These products will talk to you and inform you on their status, you will be able to talk to them and ask them things like “How long until the wash is done” or “What products am i missing in the fridge?”. The fridge also has a health manager which takes into account age, gender, weight and body mass index to develop daily or weekly meal plans based on personal profiles. These products were announced at the LG press conference during CES 2014 in Las Vegas. As of now there is no official release date but we can expect these products very soon. You might already be familiar with the Apple TV, Roku and Google chromecast but these are must have items if you want to make your house more futuristic. These digital streaming devices allow you to enjoy content like Netflix, Hulu and many other video services right from your living room, you can also use them to stream movies from your PC to your TV without any problems. Among these are also gaming consoles like the Xbox One and Playstation 4 which combine both gaming and a media device. Check out our Top 3 media streaming devices list to find out which one is best. At this year CES it was all about the TV’s. Both Samsung and LG introduced new curved smart tv’s that allow you to enjoy video content in an even better way then before. One of the many advantages with curved screens is you’re able to focus more light toward the user, another is the similarities they share with the human eye, they’re both curved, so this gives the potential for an image to be equidistant to your eyes. This in combination with a true 4K display will make your living room future proof for the next couple of years. Ever wanted your house to have a network of coloured lights? If you said yes then the Philips Hue are for you. With the Philips Hue you’re able to customise the colour of the lights in your house, so whether you want a bright light in your kitchen or a mellow orange in your bathroom at night then the Hue is actually very handy. You can also make the lights turn on when you’re within a certain range by customising them on the Philips Hue app, the app also allows you to turn on the lights for when you’re going to be late home from work making it look like someone’s home. You can also use the lights as your own alarm clock, with the timer option you can set the lights in your bedroom to gradually brighten over time to mimic a sunrise in your room, slowly waking you up. The smoke alarm you have in your home right now probably gets set off every time you burn your toast which leaves your waving the smoke away from the alarm to make it stop. But with the Nest Alarm the device simply gives a spoken warning that can be silenced with a wave of the hand before sounding the traditional alarm. The Nest can also be linked to your smartphone via an app which alerts home owners of any possible dangers when they’re out. If the user fits multiple alarms Nest can tell them which room the danger is coming from. Aside from just warning people about fires it can also detect the levels of carbon monoxide in the home, which has been called the silent killer. While it may not seem like it, your bathroom(s) can speak a lot for your home. Having a cutting-edge, modern home is nothing if you’re neglecting your that one sacred place—the bathroom! An easy (and rather luxurious) addition that can set your bathroom off is a towel warmer. Stylish, decorative, and convenient, a towel warmer can give your post-shower body a dry, warm and cozy place to call home. Leave a comment down below on what your favorite of the list is and if there are any you would add.